If 2017 has taught us anything, it’s the importance of being ultra-prepared for hurricane season if you live on the Gulf Coast. With two of the most destructive hurricane landfalls in U.S. history – both occurring in a Gulf Coast state – the 2017 hurricane season also resulted in many millions of Gulf Coast residents without power for days or weeks. Worse, many of those in Texas who were prepared for the flooding brought by Hurricane Harvey and had water pumps and back-up water pumps found that both failed in the absence of sufficient battery power in their water pumps and the sheer degree of flooding they encountered. Benfatti Air Conditioning & Heating services and installs top quality standby generators in Slidell, Mandeville, Covington & all of metro New Orleans and the Northshore. Never be without power again with a standby generator waiting and ready for action when you need it most! And if you’re worried about the investment, don’t be! 0% financing is available on selected models! Don’t let the next major hurricane or Gulf Coast weather event put you in the dark ages without doing everything you can to fend off disaster. Invest in a standby power generator. Additionally, outside of major weather disasters, your home may still experience periodic power outages, making a standby generator a wise investment to keep your home powered-on year-round. When it comes time to selecting a standby power generator, you have many options – and we are here to help. Our eight-part comfort needs assessment and highly trained service professionals ensure that whatever standby generator you select works best with your home or building’s unique needs. Portable standby generators sometimes appear to be an attractive outcome in the beginning as they are less expensive and highly portable. To work, you turn on the generator, gasoline or other power source – and connect your home’s appliances to the generator as needed. Note that the American Red Cross warns that portable standby generators, when stored or operated incorrectly, can put your home at risk of carbon monoxide poisoning. Also, don’t forget that portable generators require regular maintenance throughout the year whether they’re being run or not. And, they may only be strong enough to power a few selected appliances or comfort systems in your home at any given time. These units, which are placed outside the home and are linked directly to your power system, run on liquid propane or natural gas to automatically power your home if a power failure is detected. Requiring little maintenance or care, these generators wait silently until they’re needed and automatically kick on to power your entire home when you need it most. Even if you’re not home to turn them on. Benfatti is proud to offer standby generators from reliable and top quality brands like Trane and Honeywell. 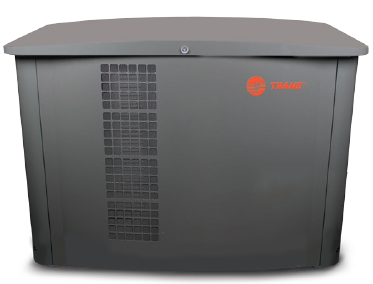 Trane has been serving families for over 100 years and is a brand known for it’s amazing reliability. However, you may not know that Trane continues to provide cutting edge comfort solutions with state of the art liquid cooled technology. Liquid cooled generators tap into your home’s existing natural gas or propane supply to seamlessly back up the circuits you choose and crank up the moment power goes out. This new technology has tremendous benefits over air-cooled generators including extended run times, improved safety, lower operating temperatures and longer engine life. Oh, and they’re much quieter! Generally speaking, automatic standby generators require very little involvement from you after Benfatti installs it. Most automatic standby generators are able to detect power failure immediately and interface with your home or small business’s power supply. Some automatic standby generators can interface with apps and other smart devices to monitor them from a distance – even if you’re on a trip away from home. With more than 25 years of experience and our commitment to quality, family-owned Benfatti Air Conditioning & Heating delivers the highest level of service tailored to your home’s specific needs. Contact us today to schedule an appointment to discuss your home’s standby generator needs. And remember to ask about 0% financing available on selected models.